If it’s April it must be Navarra. Yes, our Wine Pairing Weekend group of bloggers is traveling to Navarra this month to explore the region, its wine and, of course, the food. The inspiration for this trip came from Gwendolyn Alley who blogs with great enthusiasm (and skill) at Wine Predator. Gwendolyn also managed to wrangle tasting samples for us courtesy of the folks at Navarra Wine US. Thank you to both! Navarra is both an autonomous community and a wine region that lies north of La Rioja. The capital is Pamplona, which is famous for its running of the bulls in celebration of Saint Fermin. The wine region lies roughly within the autonomous community that is bound by France to the north, Basque Country to the west and Aragon to the east and south. As with every other region around the Mediterranean they conquered, the Romans were responsible for introducing grapevines to the region in the 1st century A.D. The Moors had seized power of the region by 711 and according to one account I read the Spanish Reconquest began in nearby Asturias only 11 years later. In 813 remains were discovered in Galicia that were believed to be those of Saint James the Apostle. The remains were transported to Santiago de Compostela where King Alfonso II commissioned a chapel to be built. By 1078 construction of the Romanesque cathedral began. Word got out and soon the Christian faithful were making the pilgrimage to Santiago de Compostela along what would become the Camino de Santiago. By the 12th and 13th centuries as many as 250,000 traveled the path every year. As you can see from the map above, the path of the Camino de Santiago converges in Navarra at Puente la Reina before continuing through La Rioja and Castillia y Leon to Galicia. Can you imagine the influence so many pilgrims would have contributed to language, food and culture in the area as they moved through? No doubt some stayed. Between 1234 and 1512 Navarra was controlled by the French. Navarra’s border with southern France has been fluid over the centuries and control of the passes through the Pyrenees gave Navarra strategic importance. In 1512 the Spanish portion of Navarra was annexed by King Ferdinand II of Aragon. The French portion of Navarra, the northern slopes of the western Pyrenees, was reunited with France in 1589. Throughout the Franco regime Navarra maintained some independence as a region. With the transition to Spains’s democracy, Navarra’s autonomy was recognized and formalized in August 1982. Navarra’s geographic location gives it a combination of Atlantic, Continental and Mediterranean climates. The Urbasa and Andia mountains to the northwest of Navarra shelter the region from the Atlantic’s harshest weather. The Urbasa, Andia and Pyranees foothills provide vineyard sites at elevation. Multiple rivers provide alluvial soils. Areas to the east are characterized by scrubland. A Continental climate in one region brings extreme summer and winter weather. The warmest area enjoys a Mediterranean climate. That’s a lot of variability to pack into a region that is approximately 120 miles in length and 60 miles wide. Navarra was declared a D.O. (Denominación de Origen) in 1933. Because the climate, elevation and soils are so variable the region has five distinct sub-zones. Variety in growing conditions gives rise to a wide variety of wine including white, rosado (rosé), red and sweet white wines. Red wine production predominates (60% of production), rosado comes next at 30% and white wine production comprises 10% of production. Tempranillo is the most widely planted red variety, followed by Garnacha, Cabernet Sauvignon and Merlot. Graciano and Syrah comprise small plantings. The main white grape varieties include Chardonnay and Viura. As you can see grape varieties include both indigenous and international varieties. Wine production is regulated by the Consejo Regulador de la Denominacion de Origen Navarra which sets the rules for vineyard yield and aging requirements among other things. Every bottle of wine from D.O. Navarra will bear one of the seals above certifying its type and origin. The variety of climates that makes Navarra so good for winemaking also applies to agriculture, and thus food, in the region. Navarra is know for its abundance of vegetables – asparagus, artichokes, red cardoon and piquillo peppers. Meats include lamb, pork, goat and rabbit. Fish is commonly enjoyed as well, because of Navarra’s close proximity to the Atlantic. This list of ingredients is remarkably similar to what is available to me in California’s Central Valley – though the seasonings used in Navarra are very different. Local asparagus is in the markets now and locally-raised lamb is always available. I decided these would be my ingredients for our local meal to pair with wines of Navarra. 2016 Castillo Monjardin El Cerezo Chardonnay — pale yellow in the glass with generous aromas and flavors of stone fruit, ripe melon and citrus. The finish is medium in length with a lingering hint of citrus pith. 13% abv. This Chardonnay is sourced from estate vineyards located in the Atlantic climate of the Tierra Estella sub-region. The name, El Cerezo, means the cherry tree and comes from a lone cherry tree planted in the vineyard. Vinification is in stainless steel and this is intended to be a Chardonnay to demonstrate the lively fruit flavors of the variety. Bodegas Castillas de Monjardin is located in Villamayor de Monjardin along the Camino de Santiago pilgrimage just beyond Puente la Reina. All wines are made using estate grapes from 220 hectares. Vineyards lie at about 600 meters above sea level and are cooled by winds called Cierzo. Bodegas Castillas de Monjardin also makes a French oak barrel-fermented Chardonnay in addition to their red wines (which interestingly includes a Pinot Noir from their small four-hectare vineyard) and sweet wine. This delightful rosé of Grenache (70%) and Tempranillo (30%) is made using the saignée method. After the grapes macerate on the skins for 6 hours the juice is bled off and fermented in temperature-controlled stainless steel tanks. The Calendas range of wines are young, fruit-forward wines intended to drink now. Bodegas Ochoa is located in the Ribera Alta sub-region of Navarra. The vineyard is located in a sunny area with scant rainfall and chalky, clay soils. This 100% Graciano is super delicious. Hints of wood aging lend complexity but do not overwhelm the delightful fruit flavors of the Graciano. It is so easy to drink. It is aged for 13 months in French oak. Bodega Inurrieta is also located in the Ribera Alta sub-region, not far from Bodegas Ochoa, and only a 45-minute drive south from Pamplona. 240 acres are planted to Sauvignon Blanc, Merlot, Cabernet Sauvignon, Garnacha, Graciano and Syrah. Elevation ranges from 300 to 550 meters above sea level. Inspired by the foods that are common to Navarra and in my local market I prepared a very simple meal of grilled lamb and asparagus salad. We enjoyed our meal outside on the patio in the warmth of a spring Sunday afternoon. We grilled lamb saratoga chops seasoned with salt, pepper and marjoram. Saratoga chops are strips of lamb shoulder approximately 1-inch wide that are rolled and tied into a medallion with twine. I buy them from a local market already tied. Use lamb chops if you prefer, but these have no bones and therefore no waste. They cost the same per pound as lamb chops in my market. The asparagus salad recipe follows this one fairly closely except that I use lemon juice (we have a Meyer lemon tree and the juice from these lemons is wonderful) instead of vinegar. I find that the salad pairs better with wine when I use lemon juice instead of vinegar. The addition of chopped egg also adds richness that makes this salad a good match for wine. One other change: the addition of fava beans because they’re in season and I love them! Surprisingly (only because white wine with red meat is not the usual pairing) all three of these wines were delicious with our meal. The Chardonnay was especially delicious with the asparagus salad. The Rosado gained even more complexity with the meal and the Graciano was just plain delicious any way you look at it. We scored with this pairing just by dumb luck. As we used to say when I was in a bowling league years ago, “I’d rather be lucky than good!” Well, not really, of course it’s best to be both lucky and good. 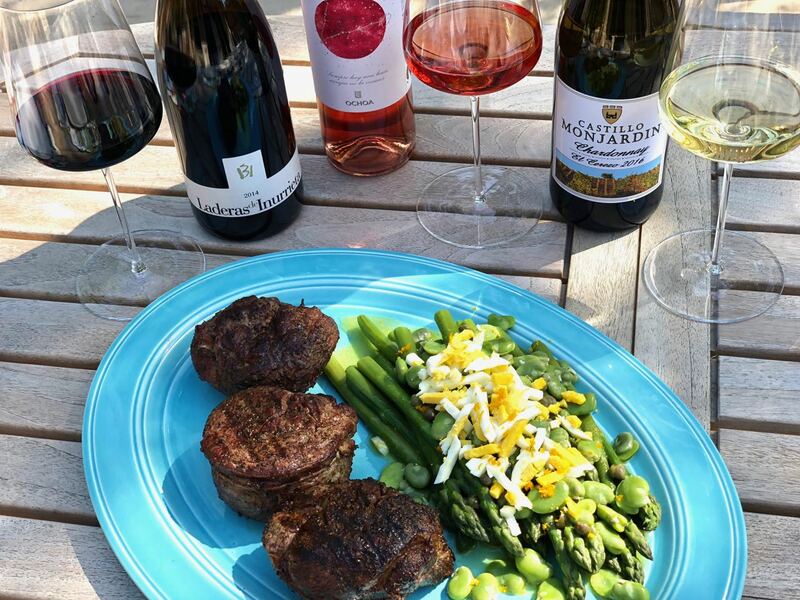 Please read on to discover the delicious food and wine pairings the rest of our Wine Pairing Weekend group of bloggers have created. I think you’ll find that if you grab a wine from DO Navarra you will be well on your way to creating a delicious meal! Join us at 8 am Pacific Time Saturday, April 14, for our Twitter chat about the wine and food of Navarra. Follow the hashtag #WinePW. Great history background on the region and your meal looks fab! I am so jealous that you have fresh fava beans plus a Meyer lemon supply! We still have super chilly weather and wind – anyway, thanks for this gorgeous mini-trip to Spain! You’ve really put together a Navarra 201 post here that I’m sure will be valuable to anyone researching the area. I’m always so grateful to find sources like this. Cheers! I do love Graciano. This whole meal looks absolutely delicious and beautiful! Thanks for all the interesting history and other background on Navarra. I had a busy patch leading up to this event so only had a chance to do very cursory background reading for this one. What an informative and comprehensive post on Navarra! I have never seen lamb saratoga chops, is your local market a national chain by any chance like Wholefoods? Interesting how food friendly the Navarra wines are, all three of my wines also paired well with my pork dish. I didn’t expect so much luck on that account either. Cheers! I love all your history of the region! Your pairing looks delicious! I will have to try this cut of lamb instead of chops We are lucky to get ours from a local farmer and as long as I tell them far enough in advance I can choose the cut. I am also a fan of asparagus and egg combos. Vinegar based sauces can be tricky with wines, good call on the sweeter meyer lemon. Isn’t Graciano just delicious? I love it but don’t come across it too often; when I do, I try to stock up.Your dinner on the terrace looks so wonderful, especially to those of us who are still waiting for Spring to arrive. Cheers to a beautiful meal paired with wonderful wines! I’m so jealous that you got to enjoy this wonderful meal and pairing al fresco. We had freezing rain here today.